As of June 1, 2016, all content on the Antiquity A-la-Carte site is made available under the Creative Commons Attribution 4.0 International License (CC BY 4.0). This license replaces the old Creative Commons Attribution-NonCommercial 3.0 Unported (CC BY-NC 3.0). 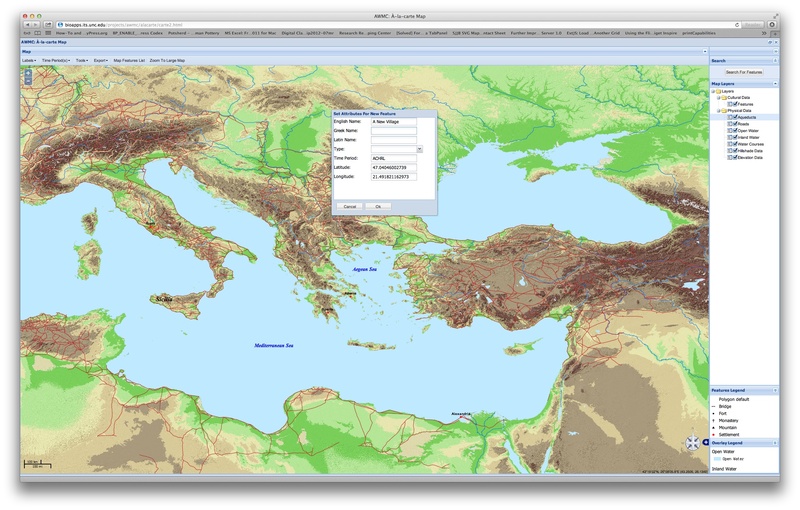 The new license provides users with significantly more freedom in how they use maps and data sets produced in Antiquity A-la-Carte; most notably, content generated on this site can now be used for commercial purposes (including any and all publications) with no additional permissions or licensing. Please direct any questions about the license change to awmc@unc.edu. The Print server is once again acting erratically. We have redone the code to automatically allow printing when it is up and to exclude printing when it is down. We are meeting with ITS in the near future to increase the stability of the Tomcat server which powers the MapFish module driving the print capabilities of our application. The AWMC is proud to announce the release of a series of geographically accurate, publicly accessible map tiles (http://awmc.unc.edu/wordpress/tiles/ ), suitable for use in nearly any web mapping application or GIS software suite. These tiles are hosted on Mapbox servers courtesy of ISAW, and are created by Ryan Horne from AWMC data produced by Richard Talbert, Jeffrey Becker, Ryan Horne, Ross Twele, Audrey Jo, Ray Belanger, Steve Burges, Luke Hagemann, Ashley Lee, and others. Offering the first (and at the time of this writing, only) geographically accurate base map of the ancient world, the AWMC tiles conform to the broad periodization presented in the Barrington Atlas, with different selectable water levels for the Archaic, Classical, Hellenistic, Roman, and Late Antique Periods. In addition, we also model inland water, rivers, and other geographical features as they appeared in antiquity. The base tiles are culturally agnostic, allowing them to be used to represent the physical environment of nearly any ancient society in the Mediterranean world. In addition to the base map and geographical tiles we also present the Roman road network, generally following the Barrington Atlas with additional work by the AWMC. 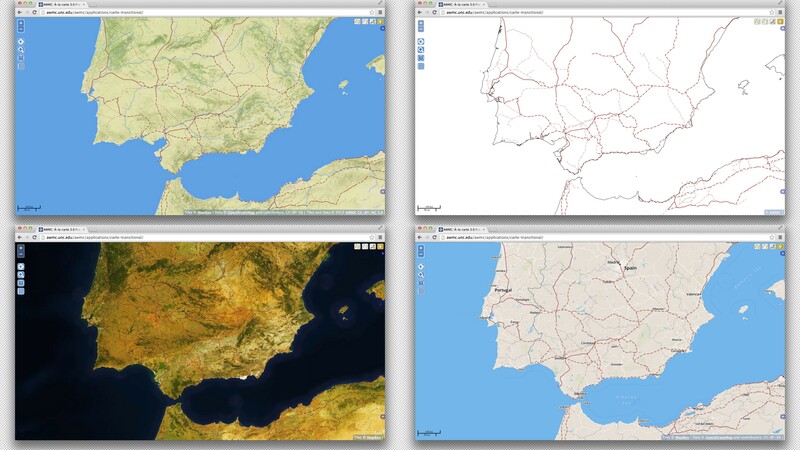 Like all of our other electronic offerings, our new tiles are released under the Creative Commons Attribution-NonCommercial 3.0 Unported (CC BY-NC 3.0) license and remain absolutely free for personal, academic, and non-commercial use. For guidelines on how to use the tiles in an application, please visit http://awmc.unc.edu/wordpress/tiles/map-tile-information. These tiles are a “living” data set, and will be constantly refined to reflect the ongoing work of the AWMC. We welcome feedback on any aspect of this work and we encourage the community to suggest enhancements, fixes, or any other comments on our dedicated site. 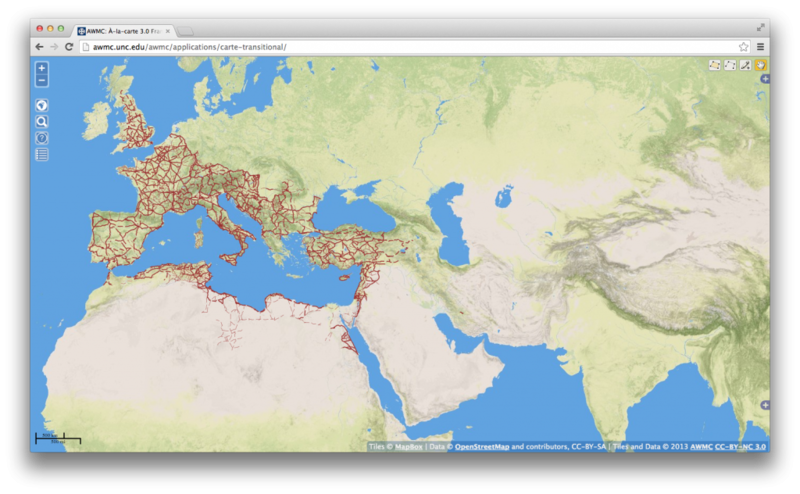 You can see the tiles in action in our API (see, for example, the Urban Area of Rome), the new Beta Version of Antiquity à la Carte 3.0, and at the Pleiades Project. 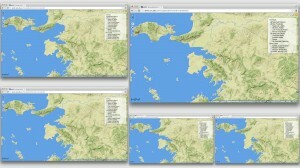 Along with our tiles, The Ancient World Mapping Center is also releasing a beta version of Antiquity à la Carte 3.0 (http://awmc.unc.edu/awmc/applications/carte-transitional/). The application, engineered by Ryan Horne, builds upon the two previous iterations of À-la-carte, which appeared in Spring 2012 and October of the same year. Continuing to draw upon the work of the Ancient World Mapping Center and the Pleiades Project, the updated version will incorporate the new AWMC Mapping tiles, along with the expanded features first introduced in v. 2.0. Until the beta version is stable with all of the previous functionality enabled, À-la-carte version 2.0 will remain operational at http://awmc.unc.edu/awmc/applications/alacarte/ . In the meantime, we welcome any feedback on the beta version as we endeavor to create an application that is useful to the ancient world community. We are particularly excited that our new tiles allow us to feature modern data alongside our ancient offerings, which will open many new possibilities and applications for À-la-carte. It has come to our attention that the gazetteer functionality was down. It has been fixed and should be functioning as normal.